The Royal Mint, a well known and established coin maker based in <?xml:namespace prefix = u1 />Wales, currently produces collector coins and coinage for around 50 countries worldwide including the United Kingdom. With an estimated 27.5 billion United Kingdom coins in circulation on 31st March 2007 and a total face value of more than £3.5 billion, the Royal Mint relies on the accuracy and efficiency of Delcam’s ArtCAM software to create their intricate coin dies. With ArtCAM Pro, artistic CADCAM (computer-aided design and manufacturing) software, the Royal Mint is able to meet the tight deadlines of over five hundred projects each year. In fact, ArtCAM Pro, was a key element in a project that reduced process times to almost a quarter of that required by traditional production methods. 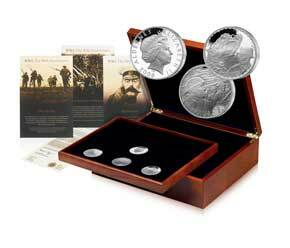 One of the Royal Mint’s projects to benefit from ArtCAM was the series of eighteen silver proof coins to commemorate ninety years since the end of the First World War. This collection was designed to pay tribute to the courage and honour of those who served in Britain’s armed forces during the four-year conflict. ArtCAM gave the engravers at the Royal Mint the flexibility to start their designs by importing: 3D models, scanned photographs or plaster of Paris moulds and files from other CAD packages. Alternatively they could design directly within the software. ArtCAM’s range of texture & sculpting tools as well as its compatibility with Wacom tablets and pens were of particular use when creating the textures of the soldiers’ clothing, their faces and the scenery, for example. The engraving team were able to sculpt with their preferred method whilst benefiting from the speed, efficiency and accuracy of a professional CADCAM software package. Matt believes that "Delcam is not just about engineering… it is artistic.” and that has enabled Delcam to develop a software package that meets the needs of artisans. To quickly and easily reproduce the poppy inspired outline around the edges of all the designs in the range, the Royal Mint used ArtCAM’s Project Tree. Keeping all related models together for quick reference and accessibility the Project Tree is great for easy duplication of required design elements. For the currency value and text for each coin, ArtCAM’s Font Editor allowed the designers to choose from ArtCAM’s font library or custom-make their own typefaces. Whilst building the 3D model, engravers were able to visualise the coin by simulating the look of their chosen material and include/exclude different relief layers as and when required. After the design stage, the Royal Mint then used the machining wizards to calculate the toolpaths to machine their coin dies and simulate a precise view of how the piece would look when machined with their selected tools. This saved the Royal Mint costly machining errors and allowed them to make changes prior to machining.